There are 565 exoplanets currently known that are as massive as Jupiter or bigger, about one third of the total known, confirmed exoplanet population. About one quarter of the massive population orbits very close to its star, with periods of less than ten days (the Earth takes about 365 days to orbit the Sun). Heated by the nearby star’s radiation, these giants are often called hot Jupiters. Despite the large and diverse population of known giant exoplanets, only two of them orbit older, evolved stars. How and why there are so many giant planets close to their host stars is still a mystery: perhaps over time they migrate in from more distant parts of their planetary system, or instead perhaps they are born there? Evolved stars that host close-in, giant exoplanets provide a valuable wrinkle to the picture, and some clues: these stars, as they age, cool off and swell in diameter, could disrupt or even swallow any nearby planets. Finding examples allows astronomers to refine their models of planet formation and evolution. CfA astronomers Dave Latham, David Kipping, Matthew Payne, David Sliski, Lars Buchhave, Gilbert Esquerdo, Michel Calkins, and Perry Berlind and their colleagues have discovered two new giant exoplanets around an evolved star. Kepler-432b is about 5.4 Jupiter-masses in size and orbits every 52.5 days – it is the third known example of a close-in giant around an evolved star; Kepler-434c is 2.4 Jupiter-masses and orbits much farther away, in 406 days. The host star, Kepler-432 has a mass of about 1.35 solar-masses, an age of about 3.5 billion years, and it has just finished its stable lifetime burning hydrogen and begun to swell in size, with a current diameter of 4.16 solar-diameters. The astronomers found that the massive inner planet is strange in at least three ways. First, it is not highly irradiated or hot, unlike typical hot Jupiters. Its orbit is highly eccentric (meaning that its distance from the star varies considerably over an orbit), suggesting that it may have migrated to this orbit. Finally, its spin axis happens to be closely aligned to the star's, another curious property, especially since it is usually not found in planets that have migrated. The results highlight the remarkable range of exoplanet properties and possible formation mechanisms, and imply either that Kepler-432b is an intrinsically rare case, or that it represents a common class of exoplanets that are usually destroyed as their host star ages, but which in this case has so far managed to survive – though its days are probably numbered (perhaps only another few hundred million years). 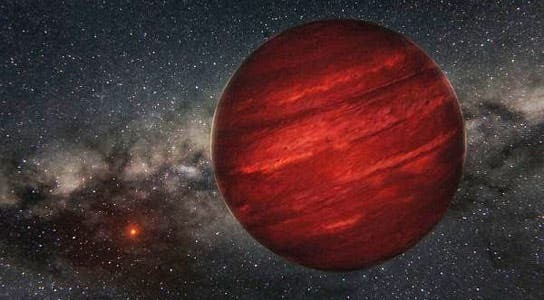 Small Dim Star with a Giant Planet Discovered –"Its Atmosphere will be Intriguing"
Strange Alien Atmosphere of the "Diamond Planet"
Kepler Mission Data –"Reveals Alien Planet Weather Cycles"